Another of the papers found in the vast, dusty piles of crap I sorted through yesterday can be seen at left. 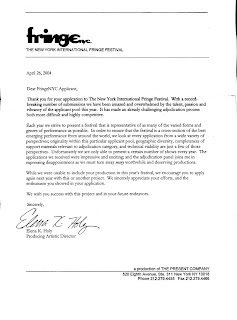 Turns out that the last time I submitted a show for FringeNYC was 5 years ago and, as I'm sure I've told you, they were not interested. Since today is the day the decision letters for this year's festival start coming out it seemed like a bad idea to throw out my old rejection letter. It felt too much like tempting fate to replace it with a new one or something. Much better to share it with the whole wide internet. So, yeah, that whole not getting my hopes up thing is working really well, thanks for asking. Ah, well. Good luck anyway!